Apricorn's Padlock DT is a hardware encrypted USB 3.0 Desktop drive. Simple and easy to use, Padlock DT offers unparalleled security. Additionally, Padlock DT's software free design means it can be deployed without the need for Admin rights and will work with any USB enable operating system. Apricorn DT offers models with your choice of 128-bit or 256-bit AES XTS hardware encryption and authenticates the PIN number via the integrated keypad. 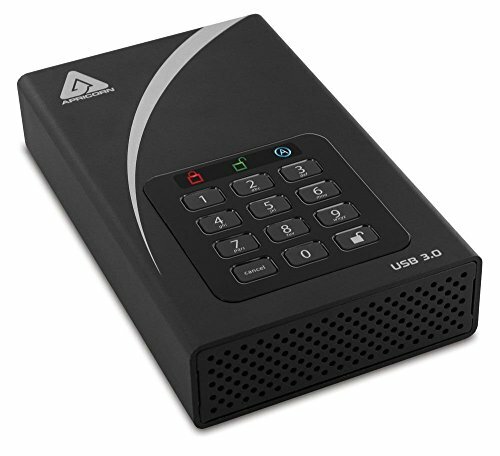 Padlock DT ships with a USB 3.0 cable, AC adapter, Quick Start Manual and comes pre-formatted in NTFS Padlock DT can be configured with independent Admin and User PINs. If the User forgets their PIN, the drive can be unlocked using the Admin PIN. Padlock DT also employs a useful drive reset feature that clears all PINs and data, and creates a new randomly generated encryption key, enabling the drive to be redeployed as needed. The unattended Padlock DT can be configured to lock after a pre-determined amount of time. Compatible with most standard security locks, the lock slot enables the drive to be secured to your desk or other permanent fixture. The Aegis Padlock DT uses a three pronged approach to protect against a Brute Force attack. The first step is to deny access until the drive can verify the user PIN. After several incorrect attempts the drive will lock itself, requiring the drive to be plugged in again to input a PIN. This feature blocks automated attempts to hack the PIN numbers. Lastly, after a predetermined number of failed PIN entries, the Padlock DT assumes it is being attacked and will destroy the encryption key and lock itself requiring a total reset to redeploy the drive. In addition to encrypting all of the PINs, data and the encryption key itself, the encryption chip and circuitry of the Aegis Padlock DT are completely protected by a super tough epoxy compound, which is virtually impossible to remove without causing permanent damage to the electronics.